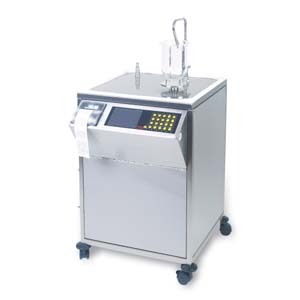 The PT-DDS4 Media Preparation and Degassing System is a vital part of all dissolution testing systems. Deaerated media are critical to the reproducibility of dissolution results. The PT-DDS4 can prepare up to 25 litres of preheated media, which is degassed by a combination of heating, vacuum and circulation. The medium is dispensed by weight (gravimetric) over the range of 250 to 5000 g or volumetric directly into the dissolution vessel inside a dissolution bath over a range of 250 to 5000ml, dosing correction by entering media density. Time saving is also a key feature as operational temperature equilibration in the dissolution vessels is far faster. Print out medium type, operator name and dispensed volumes using the alphanumeric keypad for data entry. Online mixing of Bufferdirectly inside the PT-DDS4, using the grafimetrical buffer supply option, large LC Display, alpha-numerical keyboard, easy cleaning of total system, movable base, built-ingravimetrical calibration procedure needs certified 1 kg weight only, full validation and qualification procedure included. This are some of the highlights of the PT-DDS4.